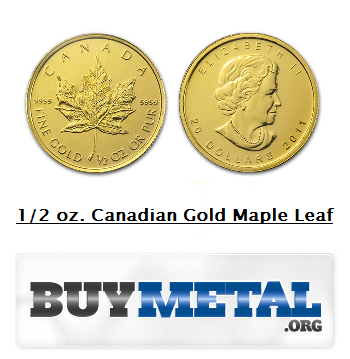 Gold Maple leafs are the official gold bullion coin for Canada. They are produced by the Royal Canadian Mint. 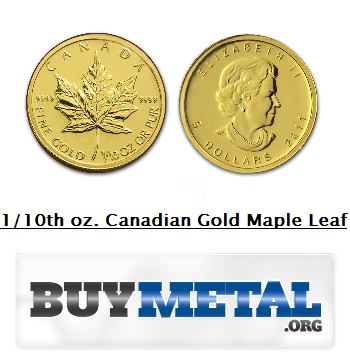 The Gold Maple Leaf is so significant because it is one of the purest gold coins in the world, coming in at .9999 or 24 karat gold. Some issues of the coins contain .99999 pure gold which means they essentially have no base metals in the coin apart from gold. All of the gold in these types of gold coins comes from mines within Canada. The coin was first introduced in 1979 and at the time was the only gold bullion coin besides the South African Krugerrand. Maple Leafs produced in the years 1979-1982 only contain .999 pure gold which is actually the amount most other gold coins today contain. The coin is produced in 1/20th, 1/10th, 1/4,½, and 1 ounce weights. These are face-valued at 1,5,10,20, and 50 Canadian dollars respectively. The design of the Gold Maple Leaf is identical to that of Silver Maple Leafs. On one side of the coin is a depiction of a maple leaf while the opposite side of the coin boasts and image of Queen Elizabeth II. In 2009 there was a slight variance in the design of the coin when the Canadian Mint released a 2010 Olympics version of the coin. This is because the 2010 Winter Olympics were being held in Vancouver, Canada. Although the coins are simple in design that does not keep collectors and investors from flocking to the coin. 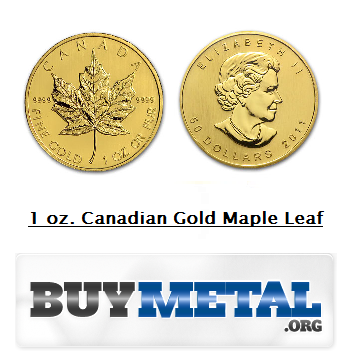 Gold Maple Leafs are one of few coins that are incredibly great for investing. These coins are pure gold, purer than most gold coins world-wide. The high demand for these coins makes them hard to find at a reasonable price, but for those able to purchase the coin, they are making a great purchase because its value will only rise. The one problem that constantly arises when talking about the Gold Maple Leaf is that since it is almost entirely gold it shows wear and tear from being handled. Gold is such a soft metal that pure gold shows wear and wears out very easily. The only way to solve this problem is to take even extra care of these coins once they become part of your collection. 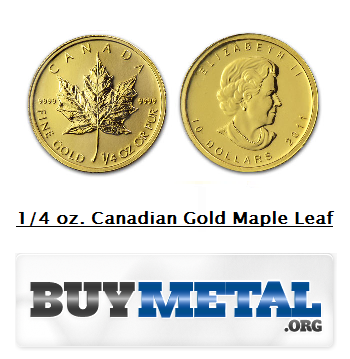 Gold Maple Leafs are another coin that is very much available in North America and obviously, more specifically, Canada. Foreign investors and collectors have had their eye on these coins since their inception and even though they are relatively young coins they are becoming very rare.